Aberdeen councillors have voted to allow taxis to use a controversial city bus gate – and to consider reducing the speed limit there to 20mph. 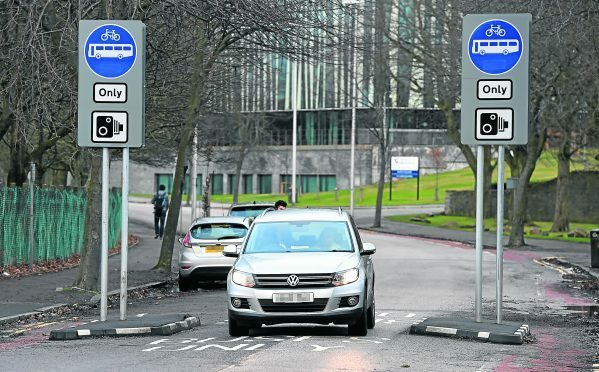 The Bedford bus gate has long been a source of frustration to motorists in Aberdeen, with more than 3,00 fines issued to drivers going through it in July alone. Yesterday the ruling Conservative, Aberdeen Labour and Independent administration signalled their commitment to the measure. But they also vowed to review the road safety measures outside Sunnybank Primary School, repair nearby cycle lanes and look into introducing new signage. The opposition SNP group had wanted officers to investigate setting up a system where residents near the gate would be able to buy permits to pass through- pointing to a similar system in place in Sheffield. But officers said that the suggestion would “complicate” the issue with new number plate recognition cameras needed and they were defeated when it came to the vote. Council roads spokesman Ross Grant said: “This has no doubt been one of the most high profile traffic issues in Aberdeen for some time.